We took the ferry from Passignano and entered the charming medieval village on Isola Maggiore. It is one of three islands on Lake Trasimeno, situated on the Umbrian border close to Tuscany. One of the great things about being there is that you can walk about without having to watch out for traffic. In past centuries fishing was the main occupation but now the main source of income comes from tourism. Close to the arrival dock, the pretty main street of Via Guglielmi is paved with bricks and has beautiful buildings on both sides dating from the 12th century. The island’s inhabitants (all 35 of them) live in this group of houses. The Chiesa del Buon Gesù is the third building you come to on the left. The adjacent building is the Casa del Capitano del Popolo which is the centre for the documentation of the history of Isola Maggiore. Opposite the church is the Lace Museum. Surprisingly, “Irish Stitch Lace” was introduced to the island in the early 20th century by Irish nuns. The lace is of such high quality that it was even worn by Queen Margherita of Savoy. The art of lace-making has been handed down from mother to daughter and even today you can see some of the island women at work in front of their doors. The next church we passed the Romanesque-Gothic church of San Salvatore. We took the path across the island through groves of centuries-old olive trees and bordered by cypress trees. You can also take a 2km lungolago walk around the perimeter where the pine and oak trees grow. There are hidden treasures all over the island and few tourists about. At the highest point on the island stands the Chiesa San Michele Arcangelo. Inside are paintings by artists attributable to the schools of Giotto and Cimabue and a Byzantine icon of the Madonna and child. Guglielmi Castle also known as Castello Isabella was built on the grounds of a Franciscan monastery in the 1880s. Unfortunately we could not see inside because it is in the process of being renovated by the local commune; the works started in October 2005. I look forward to seeing it in the future, restored to its former glory. We made our way to the rock of St Francis where the saint is said to have landed. 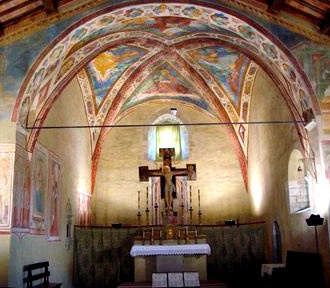 Nearby is the small Chapel of San Francesco which was built around a tiny cave where St Francis slept when he stayed here during his Lenten fast in 1211. I was enthralled by the views across the lake from here and captivated by the island's peace and tranquility. Isola Maggiore has a charm that comes from the fact that it is so rich in architectural and artistic relics of a splendid past, set in a beautiful, natural unspoiled setting. …this pianist playing a grand piano! How did they manage to get it there I wonder? Evening sun rays streamed through gaps in the clouds like gateways to Heaven. The musicians were starting to perform a free two-hour performance specially created by Vincenzo Zitello for the annual ‘Music for Sunset’ series of concerts. Dear Nora, thank you for bringing back sweet memories of Trasimeno sunsets! The concert near the lakeside sounds fantastic! I love your photos. Looks like you found another jewel in Italy. Those photos are beautiful. Thank you Tatiana for inspiring me to visit Lake Trasimeno. 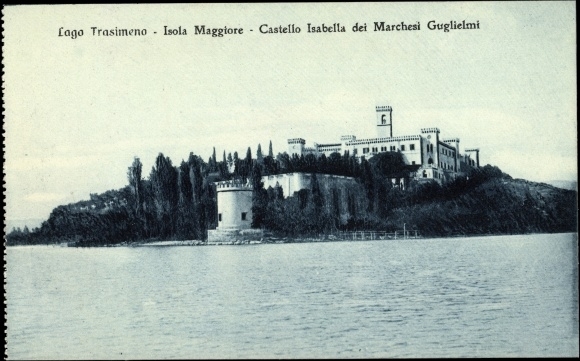 If it wasn't for you I may never have discovered Isola Maggiore. Thank you for your lovely comment Noel. Although there are many places outside of Abruzzo that are worth visiting, Abruzzo has something extra special - it always feels like 'home'. Wow-I can't believe the piano and harpists on the shore! We drove around the lake once on our way to Bevagna, but didn't take the time to look around. Thank you for sharing your visit with us. Thank you for your lovely comment Janie. Hope you get time to have a look around Lake Trasimeno next time you visit the Genius Loci in Bevagna!